There are many different types of organizations that follow different hierarchies. Some of these are different to others but in most cases the structure of any hierarchy is more or less similar, be it any organization, company, firm, non-profit organization etc. The efficient management of any firm or company requires proper division of labour which ensures that all the work is divided into various departments that are specialized to do their part. In this way, the final product, which is a result of the collective efforts of the various departments will be of good quality. Two of the most important positions in the hierarchy of any firm, organization or company are the Director and Manager. These two personnel have very important tasks in the efficient running of the organization and must ensure that those under them are doing properly the tasks that they are assigned. The two positions are very different in the duties they demand. In this article, we will properly define the position of a manager and a director and differentiate them at the same time. To begin with, directors are different from managers in the roles of leadership that they have. The board of directors are responsible for providing intrinsic leadership as well as direction for an organization. They also have to establish and then maintain its mission, values and vision. Managers, however, have to carry out the strategy on behalf of the directors. The two positions also vary on account of decision making that is involved. The future of the organization is determined by the directors. Moreover, directors also determine the structure and strategy of the organization and ensure that its assets and reputation are protected. They need to take decisions taking in account the effect on stake holders. Managers, however, do not have to take these decisions. They are concerned with implementing these decisions and the policies that are made by the board of directors. When we talk about the long term prosperity of the company, the ultimate responsibility falls on the directors and not the managers. In addition to this, directors have greater legal responsibilities than managers. They are required to work with skill and care so as to ensure that all their actions as well as the working of the company is completely legal. Any inability to do so, or any illegal way in which the company works will eventually be blamed on the directors who can be made liable in civil law and/or criminal law. Moving on, managers are merely appointed and dismissed by the directors themselves and have no legal requirement for which they can be held responsible. In contrast to this, directors can be held accountable by the stakeholders as well as shareholders for the performance of the company and can be removed from office or made to work in a certain manner by them. Therefore, there is a difference in the reporting relation of directors and managers. The values and ethics of the company are solely determined by the board of directors and they can be held accountable for any poor work ethic. Managers, however, have the duty of enacting the ethics but take their direction from the board of directors. allana. "Difference between Director and Manager." DifferenceBetween.net. 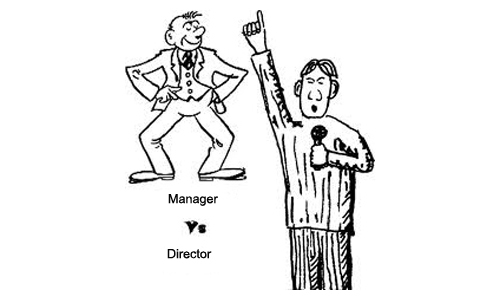 February 26, 2018 < http://www.differencebetween.net/business/management-business/difference-between-director-and-manager/ >.